This week I (Susan) started working with the STEP course (Strengthening Tokples Education in PNG), which trains Papua New Guineans to teach and promote vernacular literacy in their own communities. (Tokples is the Pidgin word for a vernacular, or local language.) 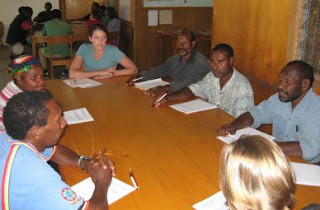 We have participants coming from all over Papua New Guinea, with a variety of backgrounds. Some live near cities, and are comfortable with English, while others come from much more remote locations, and while they may know three or four local languages, English is a struggle for them. The course has been full of surprises for me, and it’s only been two days! As with many orientations, the first day was filled with introductions and getting-to-know-you activities. As we went around the room and said our name, where we were from, and then mentioned our favorite hobbies or activities, we heard a lot of typical answers you would expect. “I like to read.” “I like to snorkel.” “I like to cook.” But then, towards the end, one Papua New Guinean stood up and proudly proclaimed, “My name is Sylvester, and my favorite thing is to hunt crocodiles in the river at night!” Only in PNG. I thought that as a mentor I would spend my time discussing literacy theory and explaining assignments to my students, but I didn’t expect to teach them how to use a 3-ring binder. Some of the things we take for granted, many of our students just haven’t experienced before. 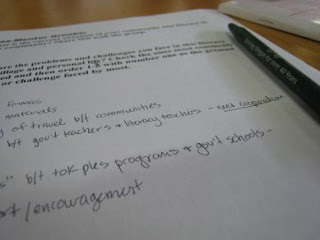 This morning we had a class on note-taking and on how to keep your notes organized. For this purpose, each student was given a big binder and a set of dividers. I showed them step-by-step how to write the names of subjects on the tabs of the dividers, how to open and close the rings, and how to insert the papers into the different sections. They caught on right away, after they had been shown how to do it the first time, but I was surprised at some of their initial mistakes, like trying to turn pages without first closing the rings of the binder. Some of the same confusion surfaced again when we learned how to take notes (you know – outlines and bullet points and all that). I realized that at some point in my past, someone must have taught me the way to take notes. I just can’t remember learning, because I’ve been doing it for so long that it seems natural. But it was something new to many of the adults in our class. Some of our students have completed grade 12 (which is actually quite an accomplishment in this country), while others have only made it through grade 6 or so. And you must remember that PNG schools are not at all like American schools. Most PNG schools don’t have access to all the materials that we are inundated with (think of pages-long school supply lists for children and back-to-school sales), so it’s really not that surprising that a binder would be a new tool to learn. After sitting in class and watching these adults who are competent and respected in their normal spheres feel so uncomfortable and awkward when presented with unfamiliar things, I realized that I felt exactly the same way when I first visited a Papua New Guinean village. I felt like a child, because I could barely talk, and I didn’t know how to do the most basic things, like plant sweet potatoes or wash clothes at a well. Hopefully both my students and I will continue to learn how to be more at home in each other’s world. Susan you are such a good communicator I am sure that you find ways to overcome the obstacles that this classroom faces. Keep it up, you guys are doing great!